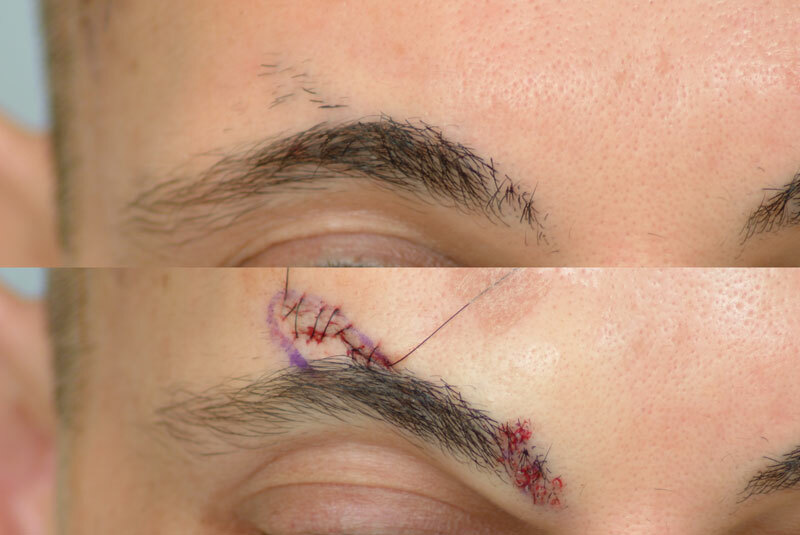 Attached are pre, post-op and follow-up photos of an eyebrow reconstruction performed at our Atlanta clinic in ‘06. 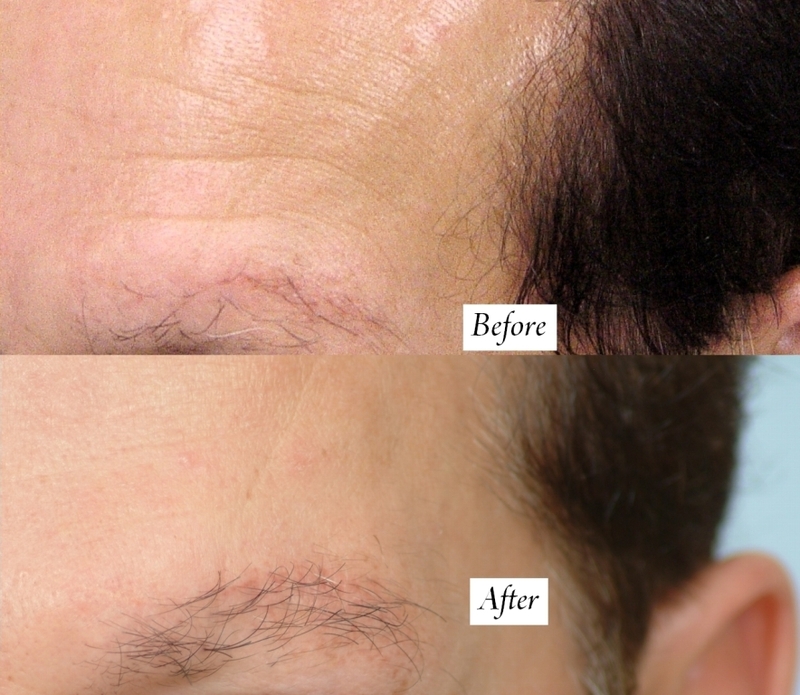 The patient’s goal was to restore density in the Eyebrows. Eyebrows are typically made up finer hairs to achieve a soft feathered effect. 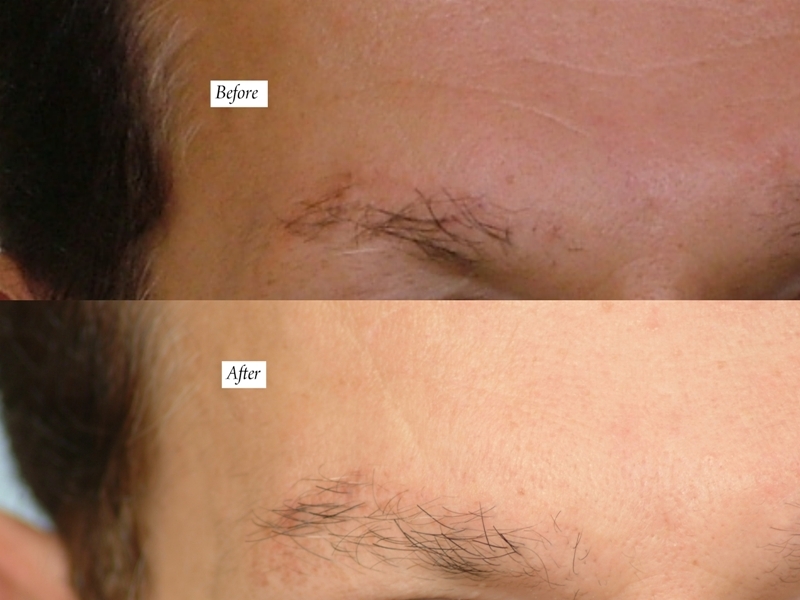 Approximately 80 body hair grafts were placed into the left and right eyebrows to treat this patient. BHT alone was performed in this case because the patient had very limited scalp donor resource. Before the procedure, the patient was aware of the limitations of body hair and that growth was not guaranteed. Body hair grows at a slower rate than scalp hair and usually grows courser as well. In this case, the advantage of using body hair is that it naturally grows at a shorter length than scalp hair which could allow for easier grooming. This patient is showing positive progress despite the limited scalp hair supply. The result has now matured and appears to look natural. In the end, fuller looking eyebrows enhance the patient’s facial features and improve the patient’s overall appearance. 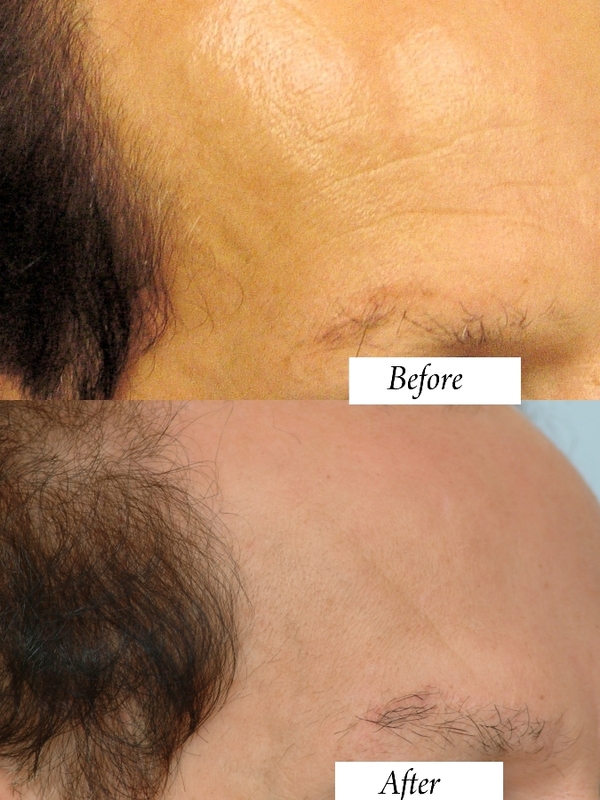 » grafts were placed into the left and right eyebrows to treat this patient. » grows at a slower rate than scalp hair and usually grows courser as well. » at a shorter length than scalp hair which could allow for easier grooming. » improve the patient’s overall appearance. BHT to eyebrows worked well. Where did the grafts come from the body? » » improve the patient’s overall appearance. » BHT to eyebrows worked well. Where did the grafts come from the body? We harvested these hairs from the patient’s chest. This result is very subtle result in comparison to our usual eyebrow reconstruction cases where a small percentage of the donor hair is scalp hair. Either way, the eyebrows must appear natural and require a great amount of artestry. 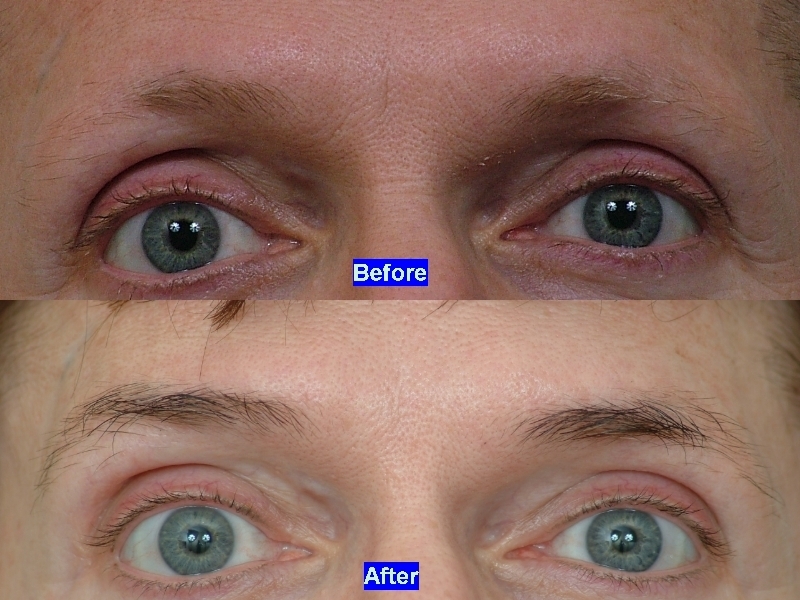 Below is a patient who recieved a combonation of scalp and body hair to reconstruct the eyebrows. Even after BHT, the eyebrows don’t look natural at all. I hardly see any improvement whatsoever. I’m unaware of how many eyebrow reconstruction cases that you have seen involving BHT but they are few in number. BHT is very fine and typically provides a less than average rate of growth when compared to scalp hair. How many eyebrow restoration cases have you seen where BHT was solely used as the donor source? The results are more subtle on the right eyebrow and the growth in the left eyebrow appears to be better. In any case, BHT is unpredictable and the appearance of the BHT result cannot be guaranteed. For every body hair that you transplant, you won’t see 100% growth of all the body hairs at any one time because of the longer cycle of the resting phase. Hair from different parts of the body has different lengths of resting cycles. There is definitely more coverage shown below in the newly attached “after” photos. The angle of the transplanted hairs is natural and overall coverage is increased. The fact that just an average percentage of the BHT grafts in the right eyebrow did grow is significant. Typical hair transplants (scalp hair) to reconstruct eyebrows have the disadvantage of growing longer than normal eyebrow hair which means that they must be groomed up to a few times a week. However, if a patient doesn’t groom the eyebrows, they can appear unnatural. Many patients have different eyebrow characteristics. Some individuals have naturally sparse, fine, or curly eyebrow hair. We have redistributed eyebrow hair that appeared to be naturally mis-placed. It is partially inaccurate to say that this patient had unnatural looking eyebrows before and after the procedure. We have redistributed eyebrow hair that appeared to be naturally mis-placed. As seen below, the appearance of the unnatural looking eyebrows are defined by the patients’ natural eyebrow hair characteristics.